This work evaluates the performance of high-resolution quadratic time-frequency distributions (TFDs) including the ones obtained by the reassignment method, the optimal radially Gaussian kernel method, the t-f autoregressive moving-average spectral estimation method and the neural network-based method. The approaches are rigorously compared to each other using several objective measures. Experimental results show that the neural network-based TFDs are better in concentration and resolution performance based on various examples. The nonstationary signals are very common in nature or are generated synthetically for practical applications like analysis, filtering, modeling, suppression, cancellation, equalization, modulation, detection, estimation, coding, and synchronization. The study of the varying spectral content of such signals is possible through two-dimensional functions of TFDs that depict the temporal and spectral contents simultaneously . Different types of TFDs are limited in scope due to multiple reasons, for example, low concentration along the individual components, blurring of autocomponents, cross terms (CTs) appearance in between autocomponents, and poor resolution. These shortcomings result into inaccurate analysis of nonstationary signals. Half way in this decade, there is an enormous amount of work towards achieving high concentration along the individual components and to enhance the ease of identifying the closely spaced components in the TFDs. The aim is to correctly interpret the fundamental nature of the nonstationary signals under analysis in the time-frequency (TF) domain . There are three open trends that make this task inherently more complex, that is, (i) concentration and resolution tradeoff, (ii) application-specific environment, and (iii) objective assessment of TFDs [1–3]. Tradeoff between concentration and CTs' removal is a classical problem. The concepts of concentration and resolution are used synonymously in literature whereas for multicomponent signals this is not necessarily the case, and a difference is required to be established. High signal concentration is desired but in the analysis of multicomponent signals resolution is more important. Moreover, different applications have different preferences and requirements to the TFDs. In general, the choice of a TFD in a particular situation depends on many factors such as the relevance of properties satisfied by TFDs, the computational cost and speed of the TFD, and the tradeoff in using the TFD. Also selection of the most suited TFD to analyze the given signal is not straightforward. Generally the common practice have been the visual comparison of all plots with the choice of most appealing one. However, this selection is generally difficult and subjective. The estimation of signal information and complexity in the TF plane is quite challenging. The themes which inspire new measures for estimation of signal information and complexity in the TF plane, include the CTs' suppression, concentration and resolution of autocomponents, and the ability to correctly distinguish closely spaced components. Efficient concentration and resolution measurement can provide a quantitative criterion to evaluate performances of different distributions. They conform closely to the notion of complexity that is used when visually inspecting TF images [1, 3]. This paper presents the performance evaluation of high resolution TFDs that include well-known quadratic TFDs and other established and proven high resolution and interesting TF techniques like the reassignment method (RAM) , the optimal radially Gaussian kernel method (OKM) , the TF autoregressive moving-average spectral estimation method (TSE) , and the neural network-based method (NTFD) [7, 8]. The methods are rigorously compared to each other using several objective measures discussed in literature complementing the initial results reported in . Various objective criteria are used for objective evaluation that include the ratio of norms-based measures , Shannon & Rényi entropy measures [11, 12], normalized Rényi entropy measure , Stankovi measure , and Boashash and Sucic performance measures . Both real life and synthetic signals are considered to validate the experimental results. The spectrogram of bat echolocation chirp sound is shown in Figure 1 a , that is blurred and difficult to interpret. The results are obtained using the TSE, RAM, OKM, and NTFD, shown in Figure 1. TFDs of the multicomponent bat echolocation chirp signal by various high resolution t-f methods. The TF autoregressive moving-average estimation models for nonstationary random processes are shown to be a TF symmetric reformulation of time-varying autoregressive moving-average models using a Fourier basis . This reformulation is physically intuitive because it uses time delays and frequency shifts to model the nonstationary dynamics of a process. The TSE models are parsimonious for the practically relevant class of processes with a limited TF correlation structure. The simulation result depicted in Figure 1(c) demonstrates that the TSE is able to improve on the Wigner Distribution (WVD) in terms of resolution and absence of CTs; on the other hand, the TF localization of the components deviates slightly from that in the WVD. The reassignment method enhances the resolution in time and frequency of the classical spectrogram by assigning to each data point a new TF coordinate that better reflects the distribution of energy in the analyzed signal . The reassigned spectrogram for the bat echolocation chirps signal is shown in Figure 1(d). The evaluation by various objective criteria is presented in graphical form at Figure 6 criterions comparative graphs. The analysis indicates that the results of the reassignment and the neural network-based methods are proportionate. However, the NTFD's performance is superior based on Ljubisa measure. On the other hand, the optimal radially Gaussian kernel TFD method proposes a signal-dependent kernel that changes shape for each signal to offer improved TF representation for a large class of signals based on quantitative optimization criteria . The result by this method is depicted in Figure 1(e) that does not recover all the components missing useful information about the signal. Also the objective assessment by various criteria does not point to much significance in achieving energy concentration along the individual components. The spectrogram of the signal is shown in Figure 2(a), referred to as test image 1 (TI 1). TFDs of a synthetic signal consisting of two sinusoidal FM components intersecting each other. (a) Spectrogram (TI 2) [Hamm, ], and (b) NTFD. The spectrogram of the signal is shown in Figure 3(a), referred to as test image 2 (TI 2). TFDs of a synthetic signal consisting of two-sets of non-parallel, non-intersecting chirps. (a) Spectrogram (TI 3) [Hamm, ], and (b) NTFD. The spectrogram of the signal is shown in Figure 4(a), referred as test image 3 (TI 3). The frequency separation is low enough and just avoids intersection between the two components (sinusoidal FM and chirp components) in between Hz near sec. This is an ideal signal to confirm the TFDs' effectiveness in deblurring closely spaced components and check its performance at the intersections. TFDs of a synthetic signal consisting of crossing chirps and a sinusoidal FM component. 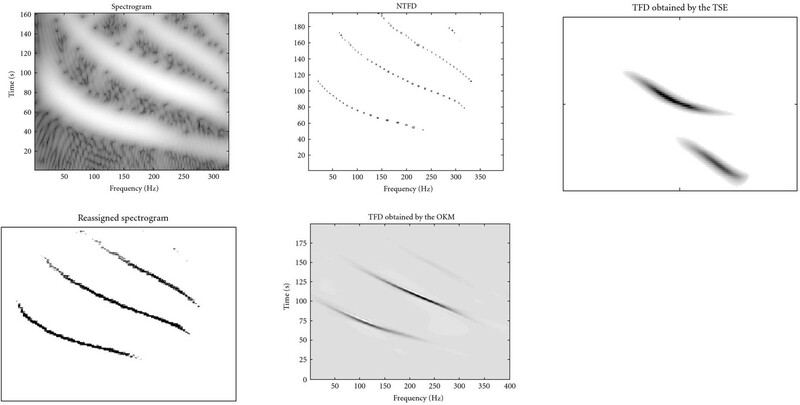 (a) Spectrogram (TI 4) [Hamm, ], and (b) NTFD. The spectrogram of the signal is shown in Figure 5(a), referred to as test image 4 (TI 4). TFDs of a signal consisting of two linear FM components with frequencies increasing from 0. 15 to 0.25 Hz and 0.2 to 0.3 Hz, respectively. (a) Spectrogram and (b) NTFD. Comparison plots, numerical values of criterion versus method employed, for the test images 1–4, (a) The Shannon entropy measure, (b) Rényi entropy measure, (c) Volume normalized Rényi entropy measure, (d) Ratio of norm based measure, and (e) Ljubisa measure. 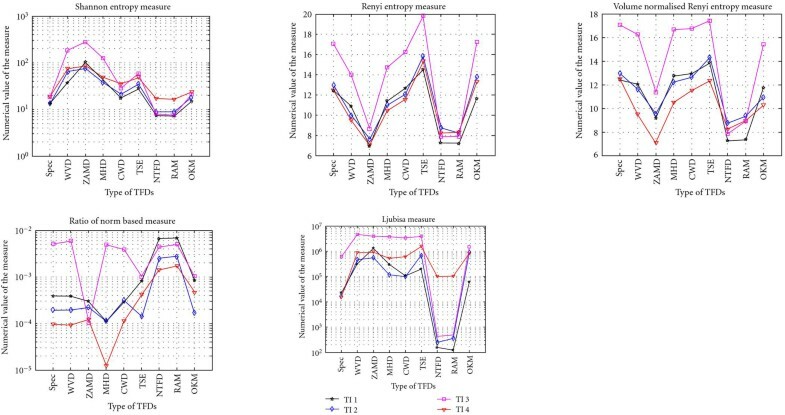 The synthetic test TFDs are processed by the neural network-based method and the results are shown in Figures 2(b)–5(b), which demonstrate high resolution and good concentration along the IFs of individual components. However, instead of relying solely on the visual inspection of the TF plots, it is mandatory to quantify the quality of TFDs by the objective methods. The quantitative comparison can be drawn from Figure 6 (in Figure 6, the abbreviations not mentioned earlier are the spectrogram (spec), Zhao-Atlas-Marks distribution (ZAMD), Margenau-Hill distribution (MHD), and Choi-Williams distribution (CWD)), where these measures are plotted individually for all the test images. On scrutinizing these comparative graphs, the NTFD qualifies the best quality TFD for different measures. Boashash's performance measures for concentration and resolution are computationally expensive because they require calculations at various time instants. We take a slice at of the signal and compute the normalized instantaneous resolution and concentration performance measures and . A TFD that, at a given time instant, has the largest positive value (close to ) of the measure is the TFD with the best resolution performance at that time instant for the signal under consideration. The NTFD gives the largest value of at time in Figure 7 and hence is selected as the best performing TFD of this signal at . Comparison plots for the Boashash's TFD performance measures versus different types of TFDs, (a) The proposed modified Boashash's concentration measure , and (b) The Boashash's normalized instantaneous resolution measure ( ). The objective criteria provide a quantitative framework for TFDs' goodness instead of relying solely on the visual measure of goodness of their plots. Experimental results demonstrate the effectiveness of the neural network-based approach against well-known and established high resolution TF methods including some popular distributions known for their high CTs suppression and energy concentration in the TF domain.